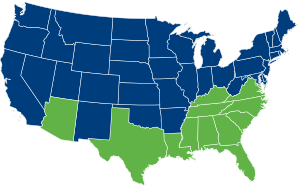 Termite control services are key to maintaining your home, especially in northeastern Florida, where the warm, humid climate makes drywood and subterranean termites a problem year-round. Each year, termites cause billions of dollars in damage not usually covered by homeowners insurance. Termites feed primarily on wood but are known to consume products like furniture, books and even insulation. The first step to protecting your home is to get a comprehensive termite inspection from a licensed termite extermination professional to identify any existing damage and potential threats. Featuring the latest advances in termite control, Nader’s Pest Raiders goes Beyond the Call® to protect your family’s health and property while caring for our environment. Today, Nader’s termite bonds provide state of the art termite control solutions through our STEPS® Total Protection System™. STEPS utilizes our expertise in Integrated Pest Management for pest and termite control combined with the most advanced technology available for industry-leading termite protection for your home and family. Nader’s - THE #1 PROVIDER OF SENTRICON® IN THE WORLD!! Nader's proprietary STEPS Total Protection System ensures your family and home are protected inside and out. A central part of that total protection is the Sentricon® Termite Colony Elimination System with Always Active™ technology. More homeowners prefer Sentricon over any other solution. Sentricon protects your home from subterranean termites 24/7/365 using the most effective and environmentally responsible solution available today. Sentricon is trusted to protect the Statue of Liberty and the White House from termites and the professionals at Nader's Pest Raiders are the leading providers of Sentricon in the world. Get the best from the best. Termite control services are key to maintaining your home, especially in Florida where drywood and subterranean termites regularly cause substantial property damage. Each year, termites cause billions of dollars in damage not usually covered by homeowners insurance.. Termites feed primarily on wood, but are known to consume other wood-based products like furniture, books and insulation. The first step to protecting your home is to get a comprehensive termite inspection to identify any existing damage and potential threats from termites. Your relationship with Nader's begins with a whole-home evaluation. During this visit and all that may follow, we never forget that it's not just a house, but your family's home. We take every precaution to treat it with the same respect and care that you do. After discussing any signs of infestation you may have seen, our Home Evaluator carefully surveys your property for potential entry points and signs of pest activity that are often difficult to detect with the untrained eye. The STEPS Total Protection System looks closely at the total picture, top to bottom, inside and out. It's the only way to determine the real root of any pest problem, as well as the best way to solve it. Mud tubes that are pencil-sized diameter or larger in diameter that are running across bare masonry or concrete and/or from the soil to any wooden part of the home. Small, thin paper-like wings found on window ledges, floors or counters. They will all be the same size and shape, approximate a ½” long. Wood or painted surfaces that feel cool to the touch and appear thin, bubbled or otherwise distorted. Wooden building parts that begin to sag suddenly, especially wooden support structures. 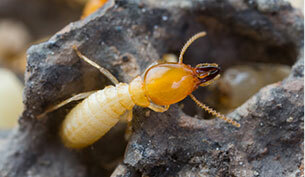 If you notice any of these warning signs, a termite control professional can help. Termite e and prevention is the key to protecting your property. Working with Nader’s Pest Raiders, you will receive unsurpassed termite protection using the most environmentally responsible methods available today.